I married a car guy. Good thing because while I appreciate having four wheels and a motor that works, I have absolutely no idea how to solve even the simplest of automotive problems. Having transportation at my disposal is one of the things I take for granted and suffer not at all silently when indisposed by a faulty transmission or even a flat tire. 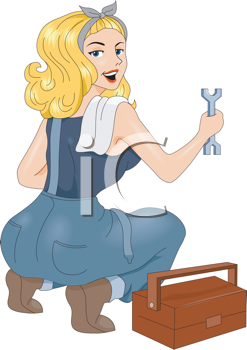 Several years ago an area auto supply merchant recognized that women tend to have less knowledge about what makes their vehicle run and keep running. They were realists, not sexists, fully understanding that older generations of ladies in particular had not been given the opportunity or permission to learn such things. When I attended high school, the tech wing was reserved for the tough guys, while the girls learned to cook, set a table, wash dishes and sew. Pathetic, but true. Thus, with this in mind, the company decided to host a weekly seminar to instruct my gender in everything from changing sparkplugs to quick fixes. Sadly, work commitments kept me from attending and trust me I have had reasons to regret that. Many times when my automotive warrior has been away I've found myself stranded for minor problems all because I hadn't attended those Car Repair 101 classes.